At the Cornerstone charter recruitment gathering, families scooped up documents from a table brandishing the phrase “Faith. Family. Culture.” — the private school’s trademark. When prospective families arrived at Cornerstone Schools’ flagship campus on Nevada Street last month, they were greeted by a staff primed to woo and sell. Folding chairs had been placed in the tidy front entrance of the northeast Detroit school, and one by one, administrators stood up to speak about the rich culture and strong curriculum that parents and children had come to know and love since the religious school opened in 1991. “You know, when you come in the fall, we’re going to have a team of parents waiting for you to teach you how to do things because there’s a way to do things. Just like when you go to a church or join a new group,” said Candace Brockman, the primary school principal and soon to be K-8 leader, to the crowd of potential families. In March, Cornerstone announced that starting next year, its flagship private Christian school would stop providing primary and middle school classes. Instead, a charter, employing the same staff and using the same curriculum, would take over. Families from the religious school would help new families get to know the new school, Brockman explained. The words “Centers of Hope” glimmered in gold typeface above her as she spoke. The history of Cornerstone is clear: The network of schools was started in 1991 by local attorney Clark Durant in response to a speech given by the city’s then-archbishop Adam Maida to the Detroit Economic Club. But how the families Brockman was addressing would get with the program — at least as it exists today — is less straightforward. Although the schools’ genesis was Christ-driven, nearly three decades after its creation, four of Cornerstone’s five schools are charters, which by law cannot teach religion. And starting next year, the program is even more ambiguous. The last standing private, pre-K through 12th-grade Christian school, the one Brockman was presenting at, will be undergoing its own conversion. Pinpointing where the religious school ended and the charter school began was difficult. Parents sitting in the room may have wondered: Am I at a meeting with Cornerstone Nevada, the flagship, independent, religious school? Or am I listening to a talk about Cornerstone Jefferson-Douglass Academy, the soon-to-open public charter school? The two entities couldn’t help but brush against each other. Following Brockman’s presentation, parents were invited to come forward and pick up enrollment information for the public charter school. Making their way to the front of the room, families scooped up documents from a table brandishing the private school’s slogan, “Faith. Family. 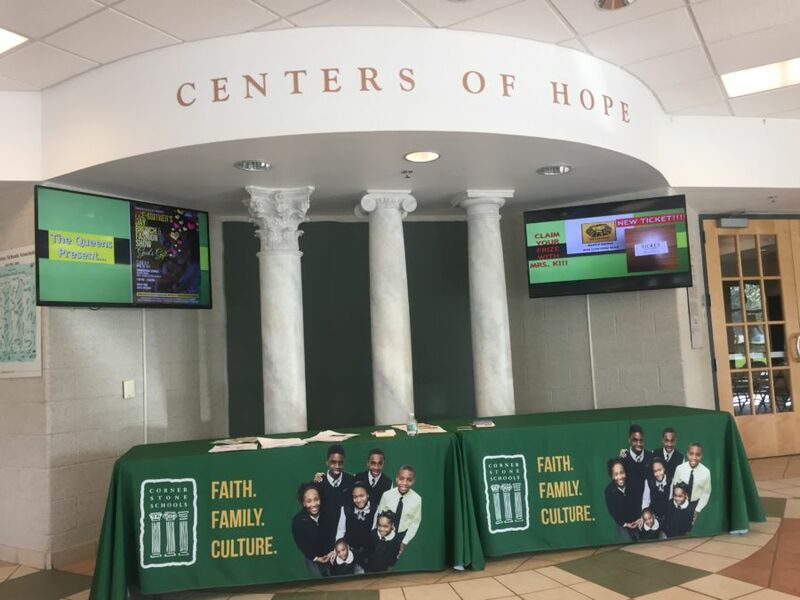 Culture.” Children grabbed bookmarks that showcased the Cornerstone schools’ principles — love, joy, peace, forbearance, kindness, goodness, faithfulness, gentleness, and self-control. Although posters and murals dotting the hallways made clear that these values came from Galatians 5:22, Fruit of the Spirit — the Apostle Paul’s nine traits of a Christian — the information was noticeably absent from the giveaways. Cornerstone’s switch from private to charter raises thorny issues about the separation of church and state — and whether Michigan’s notoriously freewheeling charter sector is set up to safeguard it. It also highlights questions about privatization — whether the Cornerstone network is using its charter schools, and the public dollars they’ll bring in, to prop up their struggling religious school. U.S. law bars public schools from teaching religion. Voucher programs, which exist in 14 states and Washington, D.C., have blurred the boundaries by allowing parents to use public education funds to pay tuition at religious schools. But Michigan does not offer vouchers. Voters rejected the practice in 1970 and again in 2000 when now-Secretary of Education Betsy DeVos helped to underwrite the ballot proposal and poured upwards of $12 million into the campaign. As a result, there are no options for religious schools in the state to get public funds for instruction. It also means that religious schools that struggle financially have little choice but to close. But the state’s chaotic school choice landscape offers a not-so-obvious loophole: Schools can shop for an authorizer to reopen as a charter school, allowing them to receive public funds in exchange for accountability tied to student learning. The downside: They must drop their religious affiliation and practices, and open up to all students. The network has transitioned from private to charter before — in 2009 they converted two of their religious schools into charters, and they’ve since opened two more. And their authorizer, Grand Valley State University, has found no problems with the Cornerstone charters overstepping church-state lines. Yet conversations with the school’s founder, Durant, highlight the needle-thin line they straddle. The comments give insight into the intricacies and strength of Cornerstone’s religious roots. But they also just toe the line, never fully compromising the school’s secular status. A big part of this is due to the outward-facing work of the network to still draw distinctions between its private and religious schools. Like the other charters, Cornerstone Jefferson-Douglass Academy will move from the purview of the Cornerstone Schools Association, the organization running the private school endeavors, to the Cornerstone Education Group, a management company that leads the network’s charters. For example, the four charter schools adopted a brand-new curriculum, and while the schools continued to use the private schools’ principles — love, joy, peace, forbearance, kindness, goodness, faithfulness, gentleness, and self-control — charter leaders do not place them in the context of the Bible or make them as much of a focus in the school day. Still, the four charter schools, which fell in the 9th, 14th, 19th and 20th percentile according to the latest state rankings, have not hit the same threshold of success that the Cornerstone private school boasts. The low achievement, which Durant calls unacceptable, spurred a recent restructuring of the charters’ management company. A new CEO and chief academic officer were hired. The network has also been re-visioning what a Cornerstone charter school will look like, with Jefferson-Douglass Academy as a forthcoming case study. Unlike the other Cornerstone charter schools, Jefferson-Douglass Academy will keep the same curriculum the private school is currently using. Additionally, a Christ-centered class will be offered after school by a third party. Finally, the time slot that previously was saved for chapel and a “Life and Teachings of Jesus” course will stay on the schedule but be replaced with intensive character development. The school is also in the process of re-thinking how they can make sure influential texts, such as the Bible, are still, legally, underscoring lessons. “I think of the things that we’ve talked about a number of times and I am certainly interested in, and that is how can we be more intentional about what the kids get exposed to,” Durant said, adding that texts like Martin Luther King’s I Have a Dream speech and Abraham Lincoln’s second inaugural speech are chock-full of religious allusions that require an understanding of the Bible to fully comprehend. “If you begin to understand what King said — the references he’s making, why he’s referencing the 40th chapter in Isaiah, why he’s doing these other things — and you have kids go and read that stuff,” Durant said. And while officials have been clear they understand the law and their First Amendment obligations, at a recent information session for religiously oriented Cornerstone Nevada parents, school officials emphasized that Cornerstone’s core principles and “culture” would go nowhere when the school transitions to a charter. “We want to have as many of our kids that we can seeding the kindergarten each year,” said Ernestine Sanders, the CEO of the Cornerstone Schools Association, the private school network, explaining how the school’s current pre-K would remain private and Christian. Current parents who expressed concerns about having students without the same background enter their children’s classes were reassured. “Is the goal to put all the Cornerstone kids in one (class) and then everybody else in another?” a parent asked. Sanders nodded. “That’s our goal,” she said. Critics of allowing religious organizations to receive charters to run publicly funded schools say Cornerstone’s hybrid model is troubling. They note that even if the charter schools stay in their lane and don’t teach religion, public dollars will still be benefiting the private, religious institution. The Nevada campus, which the private Cornerstone Schools Association owns, will be leased to the Jefferson-Douglass charter school for 13.5 percent of its yearly per-pupil funding — or an estimated $500,000. While Durant says the lease funds will be kept at an arms length from any religious programming done by the private Cornerstone Schools Association, it has been noted that the network’s only remaining religious school, the Nevada campus high school, plans to expand in the coming years. These fuzzy lines are troubling to some. The authorizer that green-lighted Cornerstone’s most recent switch, Grand Rapids-based Grand Valley State University, has experience authorizing schools run by religiously oriented operators. In 1990, one of their schools, Vanguard Charter School Academy, was the subject of an ACLU legal challenge. Filed on behalf of five families with children at the school, the lawsuit charged that the campus allowed prayer in school, taught creationism, and held a mandatory staff retreat with religious overtones. The suit was ultimately dismissed, after the school made some changes as a result of the lawsuit. But not before attracting national attention to the charter school, which was run by National Heritage Academies, a for-profit charter network founded by Michigan billionaire and DeVos friend J.C. Huizenga. Now, Grand Valley State University, which authorizes over 65 charter schools across Michigan, says it plans to keep a close eye on the church-state issue. The group even plans to hire an outside consultant to make sure the school’s space is “free of inappropriate religious symbols,” said Alyson Murphy, the organization’s director of governance and compliance, in an email. Grand Valley officials appear to have their work cut out for them, far beyond the church-state issues. Sanders told parents at the transition meeting that the school would likely not be able to serve students with all kinds of disabilities — something private schools can do but public schools cannot. Authorizers are responsible for ensuring that charter schools comply with federal anti-discrimination laws. It will have to keep a close eye on the school’s academic performance, as the other charter schools in the Cornerstone network have struggled. One campus, Lincoln-King Academy, landed on the state’s priority list in 2014, and only recently came off of it. Today, it’s the highest ranked Cornerstone charter school, falling in the 20th percentile, but only after Sanders was hired to help bring up achievement and strengthen culture. Finally, Grand Valley State University will have to make sure that the new school remains solvent — which could be a challenge if it fails to thrive in Detroit’s crowded charter landscape or if current parents grow alienated and leave. Nicole Perry said she isn’t thinking about pulling her 10-year-old son Ayinde out of the school that will soon be known as Jefferson-Douglass. But she said she was dismayed to learn about the conversion, even though it will eliminate her tuition bill. “I feel like with us becoming a charter school it’s like, ‘Oh, they’re like the other schools. When I used to say Cornerstone, it meant something different,” said Perry, who said she cried at the first meeting when she learned Cornerstone wouldn’t be a private school anymore. Still, she will be there next year — one of the parents Brockman spoke of who will guide and welcome newcomers. If you choose to send you children there then you should pay for it. My parents 60years ago did. R.L. There's a large national network of Islamic oriented charters that no one seems to be objecting to. I do not want my tax dollars going to any religious school for any reason. Period. I don't think churches should be tax-free either. Scams. As with Pell grants for higher Ed and pre-school support programs, if families and parents choose to send their kids there, why's it our business? We can all disagree with a lot of ways recipients spend publicly provided money, why fixate on this one area? What are the public schools so afraid of?....that someone will come up with a school that actually teaches about God, respect, proper behavior, and what life is really all about?